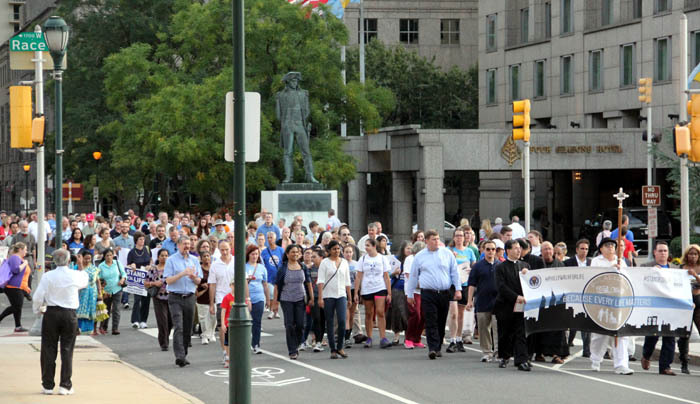 It was a busy day Sunday, Sept. 28, with the Walk for Life at center city Philadelphia’s Love Park at 3:30 p.m. followed by a procession to the Cathedral Basilica of SS. Peter and Paul for a Holy Hour capped by a 6:30 p.m. Mass celebrated by Archbishop Chaput. There was a lot of competition that afternoon beginning with the always lively annual Puerto Rican Parade on the Benjamin Franklin Parkway, the Phillies playing their last game of the season at Citizens Bank Park and the Eagles about to kick off in San Francisco. All things considered, if the rally and all that followed were a complete flop it would have been perfectly understandable. It was the complete opposite, considering the throng of about 600 at the park and others later filling the cathedral. “I’m ecstatic, there were a lot more people than we expected,” said Steven Bozza, director of the archdiocesan Office for Life and Family. Of course, Bozza had lined up a stellar cast of speakers — including Father Frank Pavone of Priests for Life; Bobby Schindler, co-founder of the Terri Schiavo Life and Hope Network; Jessica Grono, a spokesperson and role model for Persons with Disabilities; Giovanna Romero, founder of Latinos Pro La Vida; Brendan O’Morchoe, a national director for Students for Life and David Bereit of Forty Days for Life. Adding a joyful note to the upbeat gathering was the Gospel Choir of Philadelphia’s St. Charles Borromeo Parish and also the students from area Catholic high schools including Archbishop Carroll, Devon Prep, Cardinal O’Hara and a group from Roman Catholic that assisted the handicapped at the rally. Among the crowd were faithful old hands from the pro-life movement tracing back to its beginning with Roe v. Wade and many young people representing the future. Strikingly, the entire event was neither confrontational nor accusatory. While some might attribute this to the influence of Pope Francis, Bozza believes this is a trend that has been developing in recent years — for example the teachings of Peter Kreeft, who preaches that one conquers evil through forgiveness. Because Love Park is a public square, noticeable in the crowd were passersby and tourists who joined in as did a few of the humblest habitués of center city, people you don’t generally find in church or are generally avoided when “nice people” see them on the street. Their participation really fit the Gospel from St. Matthew of the day as read at the evening Mass, with the parable of the two brothers — one who told his father he would work in the vineyard but did not, and the other who said he would not but did, and so was forgiven by his father. “Amen I say to you, tax collectors and prostitutes are entering the kingdom of God before you,” Jesus said. 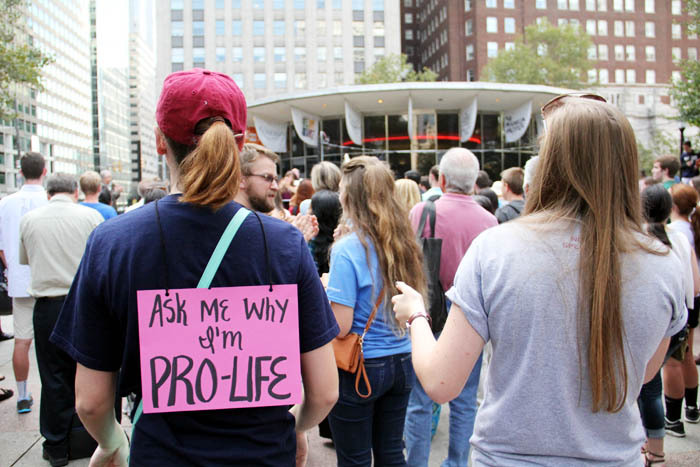 The lesson applies just as much today even to church leaders and pro-life leaders, Archbishop Chaput reminded his congregation. God forgives us our sins but we are judged by what we do, not what we say. 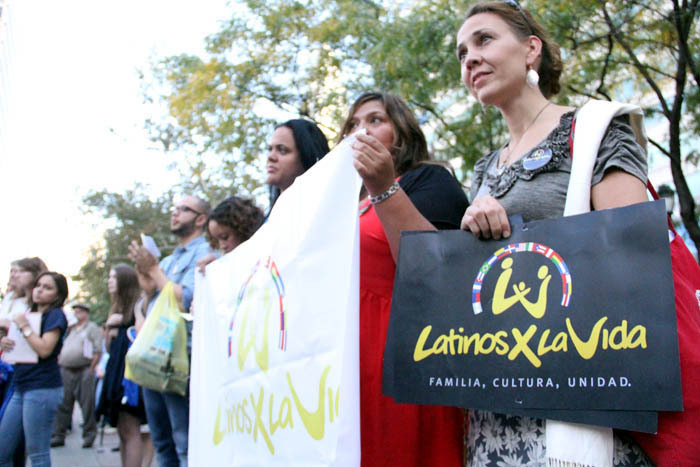 “I was deeply impressed by the homily,” said Emily Ortiz, who attended the Mass and the rally as one of about 30 members of “The Culture Project,” an emerging young adult movement in the church. “There was a lot of hope and encouragement for personal holiness and a reverence for human life,” she said.